Natural disasters happen quickly and can leave a great deal of damage in their wake. Storms, floods, and fires happen at any time of day or night, including weekends and holidays. The damage won’t repair itself on its own; in fact, rot and mold set in within hours and cause even more destruction. It’s vital to call an experienced disaster restoration company at the first sign of trouble. ServiceMaster Restoration & Cleaning has been providing comprehensive disaster restoration services to homes and businesses in Humble, TX for over 25 years. All of our technicians are trained in the latest disaster mitigation techniques and IICRC certified to provide our clients with the most comprehensive restoration services, according to standards set by the ServiceMaster Restore Quality Restoration Vendor Program (SQV). The top of the line cleaning equipment and methods we use guarantee that we will provide comprehensive disaster restoration services to residential and commercial clients in Humble, TX. We have the equipment, experience, and staff to handle a disaster of any size, from a broken pipe in your home to providing community-wide disaster support. This dedication to quality results and unsurpassed customer service has earned us the Angie’s List Super Service Award. We’re also proud to be a three-time winner of the Better Business Bureau’s Award of Excellence. Water Damage Restoration: Water is the most common cause of damage to a home or business because it comes from so many sources, from broken appliances to natural disasters. Left alone, water will spread throughout the structure and soak into building materials and furnishings. Items will warp and swell, and mold will begin to grow quickly, causing even more damage. The experts at ServiceMaster Restoration & Cleaning can remove excess water and moisture, as well as repair damaged materials. When an unexpected flood or water damage occurs, it’s important to have a plan. At ServiceMaster Restore, we have the resources and experience to get your home back in order. For more information watch the video. What are the financial threats associated with water damage? While there are some factors to consider, ServiceMaster Restore has a variety of plans to best suit your home, or office, needs. For more information watch the video. Fire Damage Restoration: Fires pose a series of problems that must be managed, from dealing with insurance companies and possibly giving statements to the police, to cleaning the scene of the blaze. ServiceMaster Restoration & Cleaning can help with the last one. We have specialized cleaning products and equipment that can stop the corrosive etching from soot and byproducts, and we can remove that horrible lingering smell. We can also rebuild structural damage, as well as restore fire-damaged items, including many you may have thought were gone forever. Mold Remediation: Mold is dangerous to clean because unless protective equipment is used, the spores will irritate eyes and lungs. Many people have mold allergies without knowing it until there’s an outbreak in their homes and they come down with what they think is a cold that won’t go away. Mold spores are commonly found in the air, and they feed on cellulose, which is found in most homebuilding materials and textiles. All they need is a source of moisture to grow. That’s why it’s vital to call ServiceMaster Restoration & Cleaning at the first sign of growth. 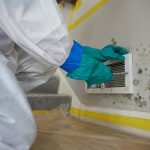 We’re licensed by the State of Texas to provide complete mold remediation, including evaluation and testing in both residential and commercial properties. Smoke and Odor Mitigation: Horrible smells can invade your home for a variety of reasons. Sewage backups, smoke, mold, and floods all leave behind odors that won’t go away with commercially available air fresheners. Once these smells get into textiles and building materials, they’re difficult to remove. The professionals at ServiceMaster Restoration & Cleaning can thoroughly remove even the worst odors from your home or business so you can stand to be indoors again without spending a fortune on candles and air fresheners that spew even more toxins into the air. No matter how your home or business in Humble, TX has sustained property damage, call on the highly qualified experts at ServiceMaster Restoration & Cleaning. Our 24-hour response time means we’re available when you need us the most. We’ll work fast to limit the damage and we work with your insurance company to process your claim as quickly as possible. Call us at (800) 303-5844 any time you need disaster restoration services.